Submersible slurry pump is also called vertical centrifugal pump, vertical slurry pump, submersible pump. It has vertical single stage and single suction system overhung structure, adopt wear-resistant alloy material, convey medium with high concentration particle. It is the ideal equipment to provide impetus for desander, desilter and decanting centrifuge. The following is the four faults and solutions about slurry pump. The reasons of submersible slurry pump don’t absorb water have many possibility, the most main reasons are due to suction pipe block and impeller damage. To solve this problem, the main method is clean suction pipe blockage and repair or replace impeller. The reasons of too large submersible slurry pump power mainly include excessive packing compaction, friction in pump, bearing damage and pump roll quantity is too large. Solutions of the four faults are unscrew packing gland bolt, adjust the gap in pump, repair or replace damaged bearing, regulating the operation of pump. The reasons of submersible slurry pump bearing fever generally due to lubricating oil and bearing, include not clean lubricating oil, lubricating oil in bearing is too much or too little, bearing damage, etc. The main solutions are use clean lubricating oil, according to the requirements add lubricating oil for bearing, repair or replace new bearing. Submersible slurry pump bearing short life is due to friction in pump, impeller unbalanced, foreign body in bearing, unreasonably equip bearing, centre shaft is tortuous. Solutions are adjust impeller balance or replace new impeller, clear bearing foreign body, equip bearing again, change centre shaft. 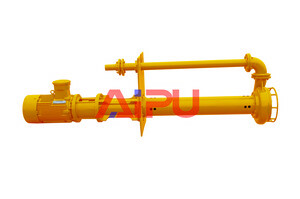 Aipu is the professional submersible slurry pump manufacturers and suppliers in China. We will supply cost-effective slurry pump and satisfactory pre-sale, sale and after-sale technical services. YZ series slurry pump has the characteristics of most interchangeable parts, convenient operation and maintenance, long service life and so on. Any interest or questions please contact us freely.